Arch, Midnight. 1930. Drypoint. McCarron 84. 8 1/8 x 11 5/8 (sheet 11 1/16 x 14 3/4). Edition of 99 recorded impressions. Illustrated American Etchers: Martin Lewis. A rich, well-inked impression printed on Whatman antique paper. Signed and dedicated 'To Charles S. White with best regards - April 4th - '30' in pencil. Housed in a striking 17 1/2 x 21 1/2-inch black wood frame. Price upon request. Building a Babylon, Tudor City, NY. 1929. Drypoint. McCarron 76. 12 7/8 x 7 7/8 (sheet 16 5/8 x 12 1/4). 6th trial proof (McCarron records 84 impressions including 4 trial proofs). Illustrated: L'Amérique de la Dépression: Artistes Engagés des Années 30, Musée-Gallerie de la Seita, Paris, 1996. A rich impression printed on FJ Head creamlaid paper with a partial initial countermark and a hand watermark. A rare proof, unknown to McCarron. Annotated '6th trial proof' and signed 'Martin Lewis imp' in pencil, indicating an impression printed by the artist. Housed in a 23 x 17-inchHoused in a 10 1/4 x 24 1/4-inch period gold leaf frame. Price upon request. Cathedral Steps. 1931. Drypoint. McCarron 93. 10 1/2 x 16 3/4 (sheet 14 x 20). Edition 42 recorded impressions (including 7 trial proofs). A richly inked impression printed on cream wove paper. Signed in pencil. Price upon request. Derricks at Night. 1927. Drypoint. McCarron 62.ii. 7 7/8 x 11 7/8 (sheet 11 1/2 x 16 1/8). Edition of 104 recorded impressions. Illustrated: Contemporary American Etching, American Art Dealers Association, New York, 1930. A rich impression printed on cream wove paper, with full. Signed and annotated 'imp' in pencil, indicating a proof printed by the artist. Price upon request. (Dock Workers under the Brooklyn Bridge). c. 1916-18. Aquatint and etching. McCarron 15. 17 3/4 x 23 3/4 (sheet 26 1/8 x 39 1/2). 5 recorded impressions (including 4 trial proofs), plus a proposed edition of 100 issued by Kennedy Galleries in 1973 (fewer proofs were printed). A fine impression printed on the full sheet of cream wove paper with deckle edges. Signed 'Martin Lewis (L. D. L.) 1973). Louise Deming Louis was the artist's wife. Price upon request. Fifth Avenue Bridge. 1928. Drypoint. McCarron 72. 9 7/8 x 12 (sheet 12 3/4 x 15). Edition of 108 recorded impressions. A rich impression printed on cream laid paper, with full margins. Signed in pencil. Housed in a 22 x 24-inch modernist gold leaf frame. Price upon request. The Glow of the City. 1929. Drypoint. McCarron 77. 11 1/4 x 14 1/4 (sheet 14 1/8 x 18 3/4). Edition of 110 recorded impressions, including 4 trial proofs. Illustrated: American Etchers: Martin Lewis; Fine Prints of the Year, 1930. A rich impression printed on Kalmer Swedish paper, with full margins. Signed and annotated "imp" in pencil, indicating a proof printed by the artist. Price upon request. Quarter of Nine, Saturday's Children. 1929. Drypoint. McCarron 78. 9 3/4 x 12 3/4 (sheet 12 7/8 x 17 7/8). Illustrated: American Etchers: Martin Lewis. Edition 107. A fine impression printed on Swedish cream wove paper with full margins. Signed and annotated "imp" in pencil, indicating a proof printed by the artist. Housed in a 19 3/8 x 21 3/8 1-inch black stepped wod frame. Price upon request. Rain on Murray Hill. 1928. Drypoint. McCarron 75. 7 13/16 x 11 3/4 (sheet 10 7/8 x 16 5/16). Edition 110 recorded impressions. Illustrated: Fine Prints of the Year, 1926. An especially rich impression with drypoint burr and plate tone, printed in green/black ink on cream wove paper. Signed in pencil. Price upon request. Relics (Speakeasy Corner). 1928. Drypoint. McCarron 74. 11 7/8 x 9 7/8 (sheet 17 1/8 x 13 3/4). Edition of 111. Illustrated: American Etchers: Martin Lewis. A brilliant, luminous impression with rich, velvety burr, printed on cream laid paper. Signed in pencil. Housed in an archival mat and a 25 x 21-inch black wood frame.Price upon request. Shadow Dance. 1930. Drypoint and sandpaper ground. McCarron 88. 9 3/8 x 10 7/8 (sheet 12 x 14 3/4). ). Edition 109 recorded impressions. Illustrated: American Etchers: Martin Lewis; Fine Prints of the Year 1931; Prints vol. II, no. 2, 1932, p. 18. 1/8-inch professionally repaired paper loss, over the left shoulder of the gentleman to the far right. A fine impression printed on cream colored Whatman antique paper with full margins. Signed in pencil. Housed in a double black and white archival mat and a 22 x 23 1/4 x 1-inch modernist gold leaf frame. Price upon request. Shadows on the Ramp. 1927. Drypoint and sand ground. McCarron 64. 9 x 10 1/2 (sheet 12 3/8 x 14). Edition 75 recorded impressions. A rich, tonal impression with drypoint burr, printed on cream wove paper. Signed in pencil. Housed in a striking French mat and a 19 1/8 x 21 3/8-inch black wood modernist frame. Skyline, New York. 1919. Etching and drypoint. McCarron 36. 8 7/8 x 10 3/8 (sheet 12 1/4 x 14 . 11 recorded impressions (intended edition 50. Lewis states that he destroyed 6 of the 11 proofs returned to him by Kennedy). A luminous impression printed on beige wove paper. An extremely rare image as apparently only 5 proofs are noted. Housed in an archival French mat and a, 18 1/2 x 20 x 1 1/4-inch modernist gold leaf frame with brown wood sides. Price upon request. Spring Night, Greenwich Village. 1930. Drypoint and sand ground. McCarron 85. 10 x 12 3/8 (sheet 13 1/4 x 15 5/8). Edition 92. A rich, tonal impression printed on laid paper. Housed in a 21 x 22 1/2-inch gold and silver Art Deco style frame. Signed in pencil. Price upon request. Yorkville Night. 1947. Drypoint. McCarron 140. 8 1/2 x 11 3/8 (sheet 10 7/8 x 14 11/2). 18 recorded impressions, including 1 trial proof. Provenance: Henry Christensen, III. A brilliant, luminous impression with rich, velvety burr, printed on cream laid paper. An extremely rare image. Signed in pencil. Housed in a dramatic 18 1/4 x 21-inch burled wood frame. Price upon request. Circus Night. 1933. Drypoint and sandground. McCarron 103. 11 1/8 x 14 7/8 (sheet 12 x 15 1/2). Edition 43 recorded impressions, some unsigned. Illustrated: Fine Prints of the Year, 1934. A rich, tonal impression printed on [S]WEDEN wove paper. Signed in pencil. Housed in a 20 1/4 x 24 1/4-inch period gold leaf frame. Price upon request. The Passing Freight, Danbury. 1934. Drypoint and sand ground. McCarron 108. 8 7/8 x 14 7/8 (sheet 12 1/7 x 17 5/8). Edition 46 (including 6 trial proofs). A rich, tonal impression printed on cream laid paper with full margins. Signed in pencil. Price upon request. Politics. 1936. Drypoint and sand ground. McCarron 118.ii. 9 3/4 x 10 5/8 (sheet 13 7/8 x 15). Trial proof 10, edition 27 (including 11 trial proofs). McCarron cites this impression to describe the second state. A rich, carefully-inked impression printed on 'FJ Head & Co' cream wove paper with full margins. Provenance: estate of Delores D. Di Paola. Signed and annotated 'trial proof 10' in pencil. Housed in a subtle silver-gold modern 17 3/4 x 18 5/8-inch frame that enhances the tonality of the evening sky. Price upon request. Martin Lewis (1881-1962) was born in Castlemaine, Victoria, Australia on 7 June 1881. He was the second of eight children and had a passion for drawing. At the age of 15, he left home and traveled in New South Wales, Australia, and in New Zealand, working as a pothole digger and a merchant seaman. He returned to Sydney and settled into a Bohemian community outside Sydney. Two of his drawings were published in the radical Sydney newspaper, The Bulletin. He studied with Julian Ashton at the Art Society's School in Sydney. Ashton, an English-born Australian artist and teacher, known for his support of the Heidelberg School and for his influential art school in Sydney. In 1900, Lewis left Australia for the United States. His first job was in San Francisco, painting stage decorations for William McKinley's presidential campaign of 1900. By 1909, Lewis was living in New York, where he found work in commercial illustration. His earliest known etching is dated 1915. However, the level of skill in this piece suggests he had been working in the medium for some time previously. It was during this period that he helped Edward Hopper learn the basics of etching. In 1920, after the breakup of a romance, Lewis traveled to Japan, where for two years he drew and painted and studied Japanese art. The influence of Japanese prints is very evident in Lewis's prints after that period. In 1925, he returned to etching and produced most of his well-known works between 1925 and 1935 Lewis's first solo exhibition in 1929 was successful enough for him to give up commercial work and concentrate entirely on printmaking. 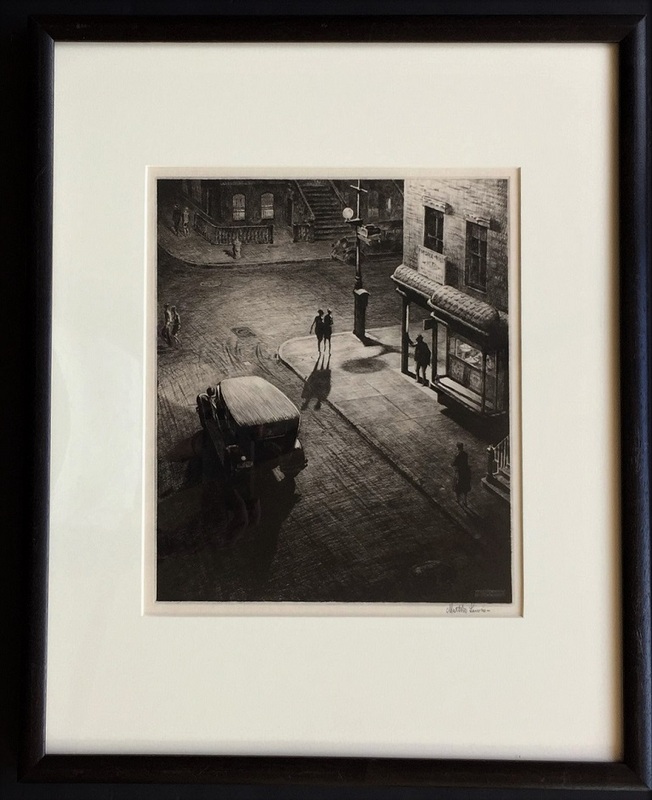 Lewis is most famous for his black and white prints, mostly of night scenes of non-tourist, real life street scenes of New York City. During the Depression, however, he was forced to leave the city for four years between 1932 and 1936 and move to Newtown, Connecticut. His work from this period includes a number of rural, night-time and winter scenes in this area and nearby Sandy Hook. When Lewis was able to return to the New York City in 1936, there was no longer a market interested in his work. He taught printmaking at the Art Students League of New York from 1944 until his retirement in 1952. Lewis died largely forgotten in 1962. Now he is considered one of the most important American printmakers of the twentieth century. To order or to be placed on the email list, please contact Jane Allinson (jane@allinsongallery.com)or send a fax to 860 429 2825.